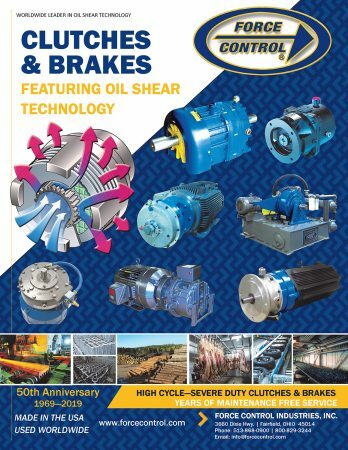 A new two-page, full colour line card from Force Control Industries provides an overview of their comprehensive lineup of clutches, brakes and clutch/brakes featuring oil shear technology for longer service life with no maintenance or adjustment. Innovative oil shear technology transmits torque through the phenomenon of transmission fluid in shear between the multiple friction discs and drive plates. This significantly reduces wear of the friction material, while re-circulating the fluid removes the heat of engagement. Force Control Oil Shear clutches, brakes and clutch/brakes are ideal for a wide variety of high-cycle, severe duty applications in industrial, aggregates, mining, bulk materials handling, overhead materials handling, dynamometer/load testing, and more. Products mentioned, with detailed descriptions and sizing, include MagaShear electric release spring set motor brakes, air-actuated, spring-set E-Stop Brakes, PosiStop Air/Hydraulic actuated foot mounted brakes, PosiStop X-Class air actuated motor and coupler brakes, Posidyne X-Class air operated clutch/brakes, Posidyne air/hydraulic actuated foot mounted clutch/brakes, PosiStop air/hydraulic actuated motor and coupler brakes, PosiStop Tire Curing Brakes, and Positorq Dynamometer load absorber brakes. All Force Control products are manufactured in their Fairfield, Ohio factory.